The Six-Pack, The Lady, and The Picnic are a collection of colorful carriers ideal for toting tasty beverages, food, and other essentials to a party, an afternoon in the park, or just another day at the office. The maker of these stylish and versatile bags is a German company called Donkey, a name that came about during the development phase when founder Florian Berger noticed that his team was not unlike a group of donkeys—deliberate and stubborn in their commitment to perfecting the design. 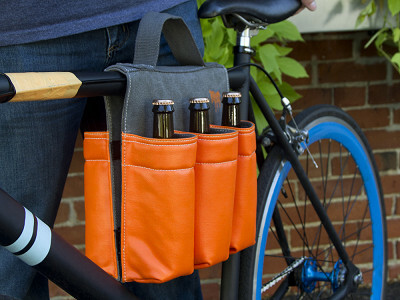 Originally intended as “bike bags," but our testers found them useful for carrying all sorts of things whether going to a BBQ, on a picnic lunch, or just relaxing it. Taking your little one for a walk? Accessorize your stroller with a Donkey Bag and you'll have plenty of compartmentalized room for bottles for the both of you, plus easy access to your keys, phone, and other on-the-go must-haves. Also great for turning an ordinary lawn chair into a true lounge chair complete with a holder for a beer, sunscreen, MP3 player, and more. Whichever Donkey bag you choose, you’re sure to find plenty of uses for it. Hello everyone! My name is Julia Drechsler and I am happy to guide you through the launch of our fabulous Donkey bags. We are thrilled that the The Grommet has chosen to showcase these great products that reflect the German passion for bicycling and outdoor entertainment. In fact, Florian Berger, owner of Donkey products and creative mastermind, was struck with the idea of developing a stylish yet practical tote while he was riding his bike through the city and parks of Hamburg. Available in a variety of styles and equipped with convenient carrying handles, these bags are the ideal tool for transporting your favorite beverages, picnic items, or sundries. Any questions? I’m happy to answer them! Does this fit on all bicycles? Hi Alan, thanks for your interest! Due to the flexible closures with velcro they more or less fit all bicycles. This is great. So I can use them on the rental bicycles in NYC!! Absolutely! A great multipurpose bag for transporting either beverages or any other items. how do they fit on wheel/power chair arms? I made saddlebags for my chair out of cloth shopping bags, very similar to 'the 6 pack'. 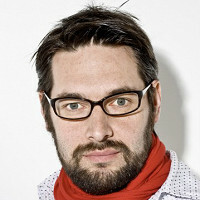 not as attractive though..
Hi Angela! It very much depends on the design of the chair and whether there is an opening to attach the bag. I would recommend the green Lady Bag as it has handles and therefore could be adjusted more easily. The orange and green bag require a wider opening to properly fit the velcro. Wouldn't that bag on that bike with those bottles make it uncomfortable to pedal? Hi Marta, the bag is designed in a way that it doesn't hinder pedaling. Both compartments have velcro on the inside to ensure proper attachment to the frame and tight fit. The Six-Pack, The Lady, and The Picnic are a collection of colorful carriers ideal for toting tasty beverages, food, and other essentials to a party, an afternoon in the park, or just another day at the office. The maker of these stylish and versatile bags is a German company called Donkey, a name that came about during the development phase when founder Florian Berger noticed that his team was not unlike a group of donkeys—deliberate and stubborn in their commitment to perfecting the design. 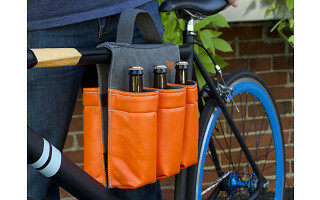 Originally intended as “bike bags," but our testers found them useful for carrying all sorts of things whether going to a BBQ, on a picnic lunch, or just relaxing it. Taking your little one for a walk? Accessorize your stroller with a Donkey Bag and you'll have plenty of compartmentalized room for bottles for the both of you, plus easy access to your keys, phone, and other on-the-go must-haves. Also great for turning an ordinary lawn chair into a true lounge chair complete with a holder for a beer, sunscreen, MP3 player, and more.